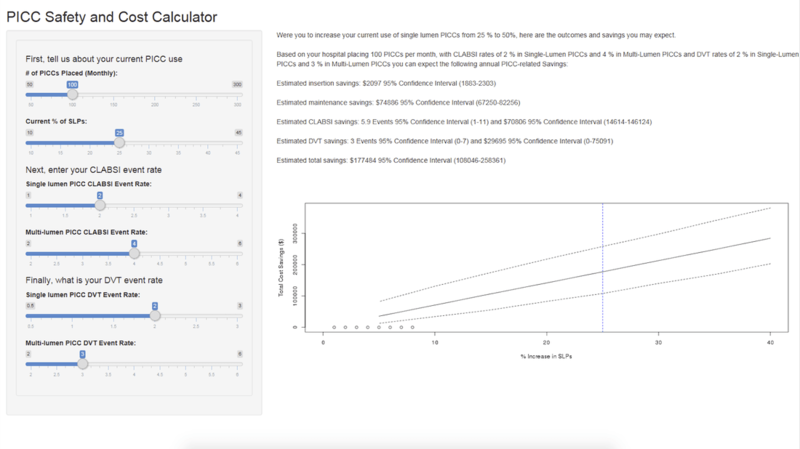 Based on the findings of the ICHE paper “Limiting the Number of Lumens in Peripherally Inserted Central Catheters to Improve Outcomes and Reduce Cost: A Simulation Study” our CLABSI cost calculator will show you the savings your hospital could expect if you implemented a single-lumen PICC only policy. This policy would focus on only placing multi-lumen PICCs if they were medically indicated. What you’ll get: The app will take your facility’s current PICC usage and give you the cost and event savings your facility could expect in 1 year if you increased your single lumen PICC use to 50%.